* IR(wavelength: 730nm): IR can help plants grow; UV(wavelength: 380nm): UV can help plants grow and kill insects. But they are very harmful to human beings, so we kindly suggest you do not use IR or UV in your grow lights, but we can add 1 or 2 pieces if you really need it in a specific situation . 1. The light contains no infrared ray or ultraviolet radiation. 2. We can customize LED grow light for you based upon your request. 3.16 years old of the following personnel must use under accompanied by an adult. ★【DESIGN】Compare to the old generation, The plant grow light is made of soft light bar, can be installed in anywhere with any shape,Add light to plant light, stipulate their photosynthesis; help plants absorb nutrients, especially some trace elements; shorten the growth cycle; prevent the rampant growth of plants. As its versatile design allows it to be used for more than just a grow light! perfect for bedrooms and other places. ★【 IMPROVE PLANT GROWTH And HEALTH 】 Blue(wavelength: 400nm ~ 520nm): Help plants grow; Red(wavelength: 610nm ~ 720nm): Help plant sprout and flowering , and is the key for flowering plants,To help accelerate the growth of indoor plants, succulent plants, flowering plants,potted plants, rapidly promoting leaves and flowers blooming. ★【HOW TO USE】3 strips grow light bar,50cm/strip, 6W/strip,DC 12V power supply adapter.you need connect male to female end,you can hook all of them together in one long string. The last one plugged into the cord that goes into the wall outlet. you can just use 1 or 2 strip. Plug in to turn on and unplug to turn off. 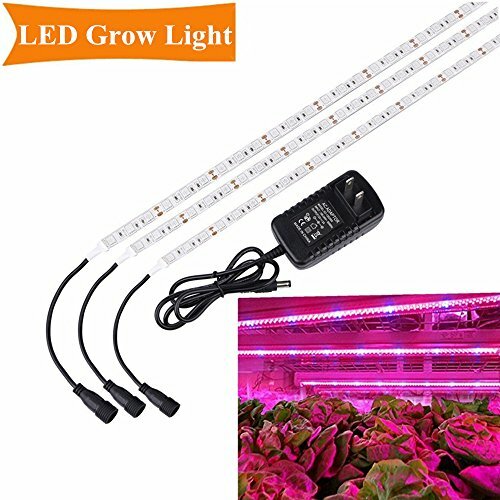 ★【SAFE TO USE】(Red Blue=5:1) This led grow light has low power consumption，high luminous efficiency and long service life, Adhesive tape for secure and easy application,stable performance Led strip. Best lighting time: 8-12hrs.keeping your temperatures down perfectly. ★【APPLICATION】Plant Light Plant tissue culture, indoor garden, vegetable cultivation, pot plants, garden, seeding, breeding, farmland, spray plant, greenhouse plants, pipeline cultivation, flowering, etc. Optimum for all stages of plant growth. Red light promote plant production germination , flowering, Blue light can enhance the chloroplasts of activities to promote plant photosynthesis. If there any issue with it, please feel free to contact us first,and we will replace or refund. If you have any questions about this product by SOLMORE, contact us by completing and submitting the form below. If you are looking for a specif part number, please include it with your message.